NAPA EDGE PROGRAM IS BACK. 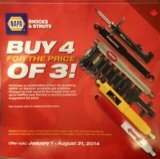 Buy 3 struts/shocks, get the 4th FREE! High Mileage on your vehicle? Maybe quick struts (complete assembly) is more what you need. Buy 2 get $50/$75, mail in rebate. Send a message or Call the shop to get a quote for your vehicle.